Why do males and females frequently differ so markedly in body size and morphology?lSex, Size, and Gender Roles is the first book to investigate the genetic, developmental, and physiological basis of sexual size dimorphism found within and among the major taxonomic groups of animals. 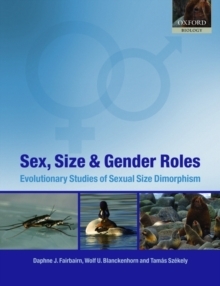 Carefully edited by a team of world-renowned specialists in the field to ensure a coherence of style and approach between chapters, it presents a compendium of studies into theevolution, adaptive significance, and developmental basis of gender differences in body size and morphology. Adaptive hypotheses allude to gender-specific reproductive roles and associated differences in trophic ecologies, life history strategies, and sexual selection. This "adaptationist" approach isbalanced by more mechanistic studies of the genetic, developmental and physiological basis of sexual size dimorphism to provide a comprehensive and authoritative overview of the subject. Throughout the volume the emphasis is on sexual dimorphism in overall size; however, the scope of enquiry encompasses gender differences in body shape, the size and structure of secondary sexual characteristics, patterns of growth (ontogeny), and patterns of gene regulation. This advanced, research level text is suitable for graduate level students and researchers in the fields of evolutionary biology, behavioural ecology, physiology, developmental biology, and genetics. It will also be of relevance and use to non-biologists from fields such as anthropology and gender studies.